Last year, Earth Day was observed by more than 1 billion people in 192 countries. This worldwide event, celebrated on April 22, inspires people to come together in an effort to reduce environmental destruction, and provide for an Earth that future generations can enjoy. Encourage students to support the environment through their shopping habits in this month’s “Go Green and Save Green” marketing plan. We have created three promotional tactics to choose from, including the “Green Item of the Week” product crowdsourcing campaign, the “Reusable Bag Discount” to promote in-store shopping and the “Recycle and Receive” coupon promotion. Host all of these activities throughout the month of April, or pick the ones you think would be most effective in your store. It’s easy to promote with our customizable marketing materials. Millenials care about their environmental impact, so green products are a great way to support a cause your students believe in. Gain feedback on which products students would like to see in the future using this strategy. Then, select one item as the Green Item of the Week, and advertise it at a discount on social media. Throughout March, use Facebook to connect with your audience, and ask customers what green products they would like to see in your store. 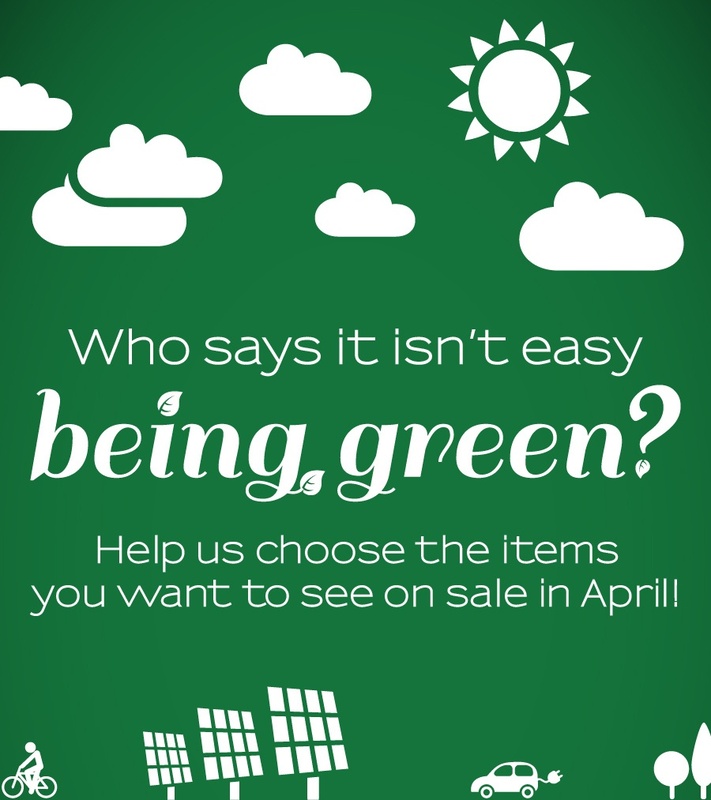 If you already have an existing green product line that you'd rather call attention to, ask students which items they would like to see on sale next month. To help facilitate this conversation, we have created a Facebook image that can be posted to your Timeline. 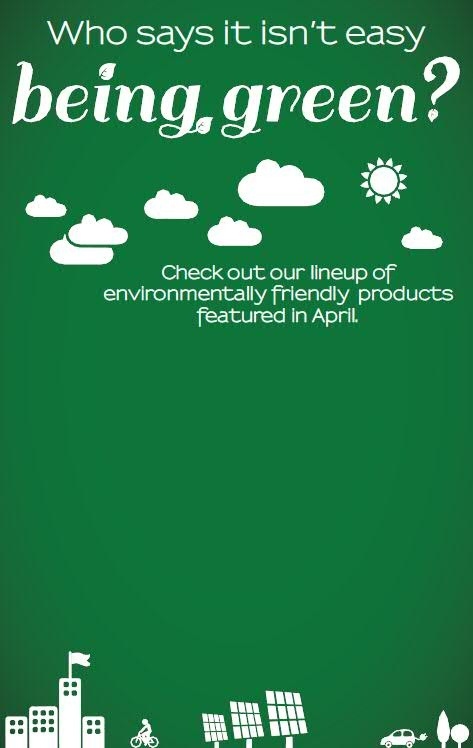 Use it to announce that the search for their favorite green products is on! Once posted to Facebook, remember to select the “highlight” option, symbolized by a star on the top, right corner of the image, to enlarge it. This makes it easy for fans to find. 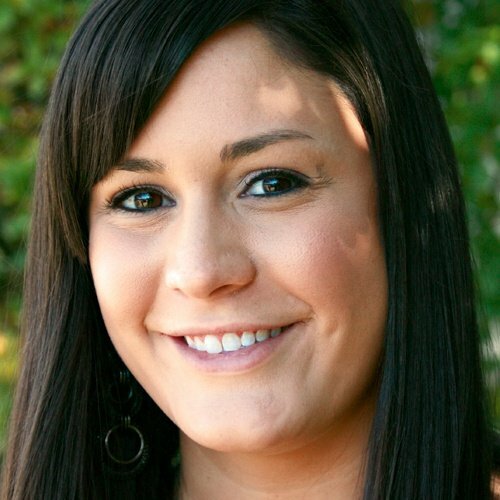 Elicit feedback from your Facebook fans. Consider creating a Facebook poll that lists the potential options for easy fan participation. Or, you can also obtain feedback by asking fans to comment on the image posted to your timeline. Either way, crowdsourcing is a great way to involve customers and create a buzz about your merchandise. Once the votes are in, establish which green items your store will need to either order or promote. Then, reveal one each Monday in April as the Green Item of the Week exclusively through social media. Be sure to point out that the product will be on sale for just one week, and include a discount to help stimulate purchase. This strategy will help generate new fans, as students spread the word about the special sale. It is also beneficial to include an image of the item in each post, so customers can view it beforehand. You can use our poster template for easy advertising in-store, too. Approximately 90 billion plastic bags are used in the United States each year, with a small portion of them making it into the recycling bin. Promote reusable shopping bags in your store to help reduce the number that are put into the environment and to entice shoppers to visit your store more often. Work with a local or online vendor to create customized reusable shopping bags. We have created a fun logo that makes it effortless. Simply send the art file to your vendor or adjust it to include your store’s name using your favorite graphic design program, such as InDesign, to further emphasize your brand. Make the bags available for purchase. We suggest providing them at a nominal rate to encourage students to pick one up! To help stimulate interest, we have included a customizable poster template you can use to advertise the bags. Decide on a discount to offer students who use their bags for future purchases made at the bookstore. We recommend 5% off an entire purchase or 25% off one apparel item. To help foster beneficial recycling practices, set up recycling bins in your store where students can conveniently drop off items that are potentially hazardous to the environment if thrown away. Decide upon the items your store wants to collect. Consider items that are common for college students to have, but are difficult to dispose of in a safe manner. Potential items include batteries, ink cartridges and electronics. Be sure to talk with a local recycling facility about what protocols should be followed for each specific material. Determine a timeline. How long will you collect the materials? You could choose to center the event around the week of Earth Day or make it go all month long; it's up to you! Announce the recycling drive to students. We have provided a poster template and a web image to help spread the word about the event. Set up bins to collect the items that you’ve designated. We suggest placing them behind the register, so a staff member can monitor donations and give a coupon for the recycled item(s). 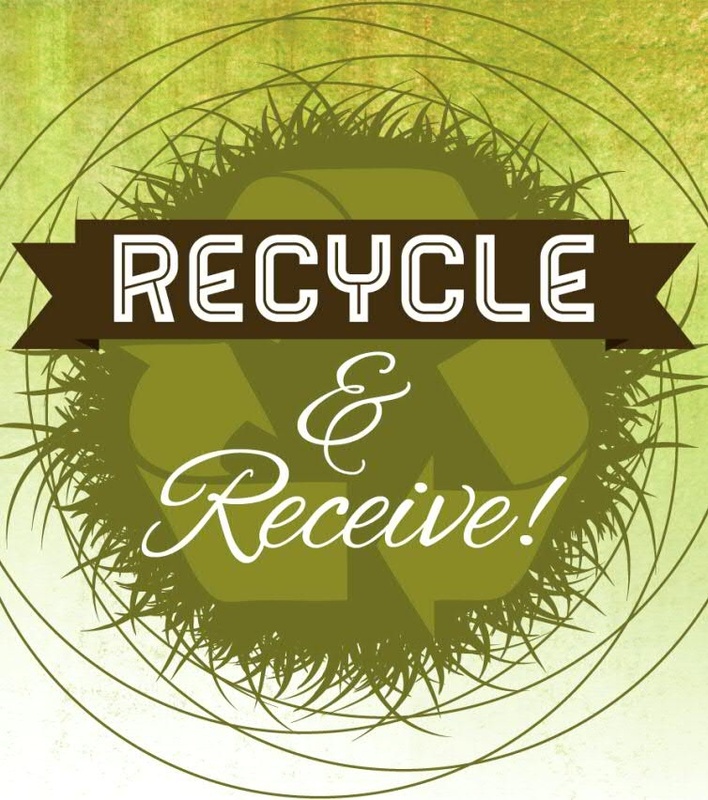 Reward students’ recycling practices by providing a coupon for a percentage off a future purchase. Decide upon a discount to be given and add it to our customizable coupon template to make it easy. 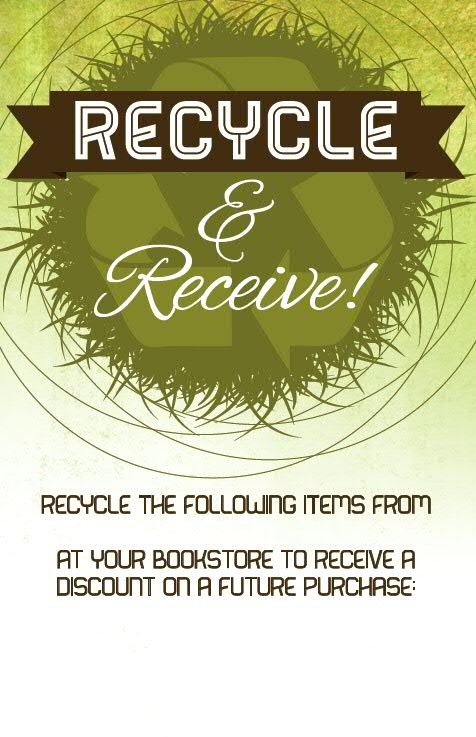 We suggest that no purchase is necessary for receiving the coupon, as long as a valid item is being recycled. This way, you're bringing traffic to the store and providing a reason for each student to return again! Or, try your own idea! 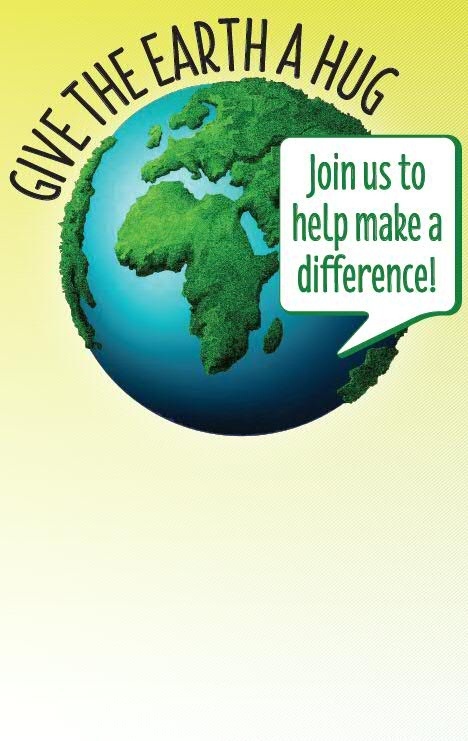 Already planning to implement an Earth Day promotion? Customize the generic poster to the right to meet your needs. Just add in the information about your event and you're good to go! Whether you try one or all three of the tactics featured, this month's Marketing Plan will help you bring traffic into the store and generate goodwill with students all at the same time. If you implement any part of this Marketing Plan, please share your experience with us on our Facebook page. We'd love to hear your feedback!